"Namo nama Shri Guru padukabhyam"
I salute that Lord Rama, who is the personification of salvation, who is a great king, who is a great man and who destroys all his enemies. Lord Hanuman told, “Please understand that Lord Ganesha, Goddess Saraswati, Goddess Durga, all the Kshetra Palaka-s, Sun, Moon, Lord Narayana, Lord Narasimha, Lord Vasudeva, Lord Varaha, Lord Lakshmana, Shatrughna, Bharata, Vibheeshana, Sugreeva, Angada, Jambavanta and Pranava are the angas of Lord Rama. Without these angas, Lord Rama will not remove all roadblocks. They again asked, “How will Brahmins and householders get the capacity to recite Pranava?” He said, “All People (even if they are not eligible to chant “Om”,) who chant the six letter mantra would get the capacity to meditate on Pranava. Those who chant silently the mantra of Rama would get the same effect as repeating the letter “Om”. After the name of Rishi, Devata and meter, japa of the Rama mantra would give the same effect as repetition of Pranava and further he explained that Rama Himself has said that pranava is a part of Rama mantra. Rama replied, “The japa of my name “Rama” removes all sins. Suppose some one is meditating on my six lettered mantra or reads my Gita or thinks of me with devotional fervor, he would get the same effect. He would get rid of the five great sins, viz. killing of father, killing of mother, killing of brothers, killing of teachers, killing of husband or even other well-known great sins, if one repeats my six lettered mantra ten million times. He also would get the immortal and ever lasting bliss. Here ends the First Chapter. 1. That king of mantra-s is the Ekakshara (one-syllabled) which is the store house of fire, which is Lord Vishnu who is lying down and which is Lord Shiva who adorned with the crescent moon. 3. Its root is the Beeja Shakti and it has to be chanted for fulfillment of desires. 6. He who is the Paramatma to those thinkers, who shines like the millions of Suns, who is like Narayana residing in the nadi-s, who is digestive fire. 8. These king of mantras consisting of three syllables also will fulfill all desires. 9. The two four lettered mantras are Ramachandra and Ramabhadra. 10. These can be chanted with the rishi and others as told before; Viswamithra is its Rishi, the meter is pankti, Devatha is Ramabhadra, The Bheeja is Shakthi. 11. This mantra should be invoked mentally in the middle of the eye brows, head, navel, thighs and feet. 13. With Lakshmana having arranged properly the arrow and the Lord being fanned by Sita. 15. The one who killed Ravana, who is extremely peaceful, and before whom stand Sugreeva and Vibeeshana. For achieving victory one should chant this sloka ten million times. 16. The five lettered mantra-s are formed by adding the root letters for Manmatha, Durga, Saraswati and Lakshmi at the beginning of the four lettered mantra, [adding OM to make it six-syllabled] and lead to the realization of the four Purushartha-s.
17. When each of the fifty mystic syllables of the Sanskrit alphabet (nasalized), as well as the root letters of Lakshmi, Saraswati, Manmatha and OM are added as the first syllable several varieties of six lettered mantras are formed. 18. Chanting the four letter mantras by adding the root letters of Sri, Maya and Manmatha as prefix and suffix of the four and six letter mantras grants all ones wishes. 19. Adding svaha, or hum phat or namah at the end, in various combinations, make up the 18-lettered mantra-s.
20. In these mantra-s, Brahma as sammohana shakti, Dakshinamurty, Agastya, and Shiva are said to be the ascetics, in that order. 21. The meter (chanda) is Gayatri, and the Deity is Shri Rama. Or, Kama-bija at the beginning and Vishvamitra the Rishi. 22. The meter Gayatri of different deities and Ramabhadra the ‘devata’. The shakti-bija is invoked as before as with the 6-lettered mantra. 23. Touching on the top of the head, in the middle between the eye-brows, heart, thighs, and feet, the mantras are recited with bija-s and anga-nyasa. And who wears the crown. 25. Then one should, with prostrations, recite “Ramachandraya and Ramabhadraya Namah”, and the king of seven lettered mantras and the fulfiller of all wishes. 26. Eight lettered mantra: Adding OM at the beginning to the two seven lettered mantras gives rise to two eight lettered mantras. OM added to the four lettered “Ramaya” and “Hum Phat svaha” is another 8 lettered mantra. 27. The Rishis and other adjuncts for the 8-lettered mantra are the same as for the 6-lettered ones. Again, the 8-lettered mantra also has Rama as the Rishi. 28. The meter is Gayatri, the Deity is Rama, OM, the pair of Shri bija-s, and Shakti bija and others are also (added). 29. Thereafter one recites the mantra-s with the 6-limbed nyasa, and recites Ramaya Namah with OM and a pair of Shri-bija-s.
30. Shiva Rama Mantra: Glaum OM, Maya-bija (heart-abiding) Ramaya Namah is recited again. Shiva, Om, Rama mantra is the giver of all excellence. 31. Sadashiva is spoken of as the Rishi, Gayatri as the meter, and Shiva-OM-Ramachandra as the Deity. And who is with matted hair. 34. Thus meditating, devoted wholly to recitation and oblations one shall chant mantra-s one-hundred thousand times, offering bilva leaves, fruits, flowers, gingili seeds, and lotuses. 35. Rama Brahma Gayatri: Even the treasures and powers, wished for by the celestials, come by themselves, when the 8-lettered Raghava brahma-gayatri (is chanted). 36. The Rishis knowing Shri-bija as my Shakti, chant the mantra-s with the limbs, as viniyoga for its adoration. And who is surrounded by Bharata and others. 38. Rama Sharana Mantra: The chanting of “Ramam sharanam mama” (i.e. Rama is my refuge) achieves much more than many other mantras which lead with difficulty to mere ephemeral gains and productive of the misery of samsara due to the greed for the transient fruits. This mantra gives the fruits of all of them without the taint of greed and other defects. There is also the 8-lettered mantra which is well-known in seven-fold ways. It is Om added to the seven lettered mantra. 39. Other mantras with more letters: The 8-syllabled mantra is (chanted) seven-fold ways. OM is added at the beginning and end of the seven lettered (mantra). 40. Nine lettered mantra: This 9-lettered mantra is offered like the 6-lettered one, to Sita in the beginning and to the consort of Janaki at the end. 43. The 10 lettered mantra is offered mentally to the head, forehead, middle of the eye-brows, palate, ears, heart, navel, thighs, knees, and feet. And who is adorned by ornaments. This mantra should be recited a hundred-thousand times with exclusive devotion. 49. The Deity is Rama, the slayer of demons. Rest of the worship is similar to the previous one. One should remember Rama holding the bow and arrow. 50. Eleven lettered mantra: With the six-fold addition of OM-Maya-Rama-Kama-Vac-sva- bija-s, and recite the 10-lettered mantra for Rudra. 52. The meter is jagati and Sri Rama the Deity; the pranava is said to be the bija, kliim is Shakti, and hrim is kilaka. 53. Reciting the mantra-s with the anga-nyasa, the rest is performed as previously. Also to be added are OM, kiim and also Bharatagraja. 55. As before, the Rishi and dhyana, and [arna meter (12-feet) or the 12 suryas?? ]; Jagati meter, and the mantra-s with anga-nyasa. 56. Reciting the name Sri Rama and Jayarama thereafter, the wise one says jaya jaya twice, Rama who sheds joy on the mind. 57. Thirteen lettered mantra: The 13-lettered mantra has the same Rishi and other adjuncts as before, the fulfiller of all wishes. Repeating the phrase twice with the anga-s and dhyana as before. 60. Sixteen lettered mantra: Thereafter, the 16-lettered ends with the kavacha and asthra. 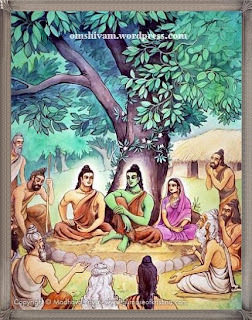 Of this, Agastya is the Rishi, Brihati is the meter, and Rama is the Deity. 61. Ram is the bija, astra is shakti, and hum the kilaka. The 10-15 lettered mantra-a are offered in sequence with the anga-nyasa-s.
62. Seventeen lettered mantra: Adding OM, the mantra is 17-lettered. OM namo bhagavata Ram at the end there-after. 63. Eighteen lettered mantra: Adding purushaya at the end gives the 18-lettered mantra, with Vishvamitra as the Rishi and gayatri meter and the Deity as Rama. 64. Nineteen lettered mantra: With the Kama bija, the mantra is 19-lettered. OM namo bhagavate Ramaya is to be recited. 65. Twenty lettered mantra: After uttering all the mantra-s one asks for all auspiciousness. When svaha is added the mantra is 20-lettered. 66. OM namo bhagavate Ramaya is to be recited. Then svaha for protection from dangers. 67. Twenty one lettered mantra: The 21-lettered mantra fulfills all one’s wishes. OM Rama svabijaa Dasharathaya thereafter. 68. Twenty two lettered mantra: Then one chants the all-auspicious sitavallabhaya (to Sita’s consort). Then this 22-lettered mantra. 69. Twenty three lettered mantra: OM namo bhagavate viraramaya is chanted. Then softly, hana hana svaha is recited. 70. The 23-lettered mantra is the slayer of all enemies. Vishvamitra is the Rishi and Gayatri is the meter. 72. silently meditates on Rama, who has put the arrow on the bow and facing Ravana, is holding the thunderbolt in his hand and has ascended the chariot. 73. One recites OM namo bhagavate Shri Ramaya and having said OM brahmane adds the words mam taraya (protect me). 74. Twenty four lettered mantra: With nama OM added, the mantra is 24-lettered. The bija-s and other adjuncts are as before. 75. Kliim, OM, and namah and bhagavate Ramachandraya thereafter, one says the word ‘all’. 76. Twenty five lettered mantra: janavashyakaraya (conquering people) svaha and kiim are to be recited mentally. The 25-lettered mantra is to include sarvavashyakara (conquering all). 77. Twenty six and twenty seven lettered mantra: With OM added at the beginning, the mantra has 26 letters. Adding OM at the end makes it 27-lettered. 79. Twenty eight and twenty nine lettered mantra: Adding svaha at the end makes this king of mantra-s 28-lettered. When joined with OM, it becomes 29-lettered. 80. Thirty and Thirty-one lettered mantra: Beginning with sva-bija, is the 30-lettered. With OM at the end, it has 31 letters. 81. O Ramabhadra the great archer! O Raghuvira the best of kings, and slayer of Ravana! Grant me wealth! 82. The Rishi is Rama, meter is anushtubh, Ram bija, yam shakti, are recited for the Ishta deity. 83. Nyasa of the mantra is done in the heart, on the head, with the 5-lettered on the shikha, and of the 3-lettered kavacha. 84. For the eyes with the 5-lettered mantra, called the astra. Holding the bow and arrow, blue-complexioned, accompanied by Sugriva and Vibhishana. 88. For enchanting the earth and attain expertise in love add “madana” (cupid) to the “Sri Rama“ along with the Bhija of Maya. 89. With 15-lettered and 12-lettered (mantra-s) and also for the 16-lettered mantra one has to perform anga-nyasa. 90. While chanting the bija-s, meditation, etc. for these, the same sequence as for the 6-lettered mantra has to be adhered. OM namo bhagavate raghunandanaya. 91. Likewise, thereafter one recites ‘to rakshoghnavishad’, and ‘madhura’ (sweet); ‘prasannavadanam’ (tranquil-faced), ‘amita-tejaseo (to one of immeasurable brightness). 92. Thereafter, say namah (obeisance) to Balarama and Vishnu, and recite mentally the 47 letters. 94. While Meditating on the 10-lettered mantra , one chants it 100,000 times. It starts with “Shriyam Sita”, followed by the six lettered mantra and ending with “Swaha”. 95. The Rishi of this mantra is Janaka, meter is Gayatri, deity is Sita Bhagavati, shrim is bija, and namah is the shakti. 96. Sita is kilaka, viniyoga is done for the Ishta. Reciting with prolonged accents at the beginning, the 6-limb nyasa is done. 97. One should meditate on Rama at the center of the hexagon (yantra), thinking in the mind him with his body shining like gold, holding a lotus,and then look at Rama as the final refuge. 99. Deity is Lakshmana, lam is the bija and shakti is namah; the 4 purushartha-s are the viniyoga. 101. For the Bharata mantra, he holding the bow and arrow, wholly devoted to Rama as the Supreme, one should utter the sound bha and bow to Bharata. 102. Rishi is Agastya, rest is done as before, to Bharata the blue-hued one who is tranquil and serving Rama whole-heartedly. 103. For the mantra of Shatrughna, recite “I worship Kaikeyi’s brave son, holding the bow and arrow”; utter the bija “sham” and ending with ‘shatrughnaya namah’, the Rishi-s and other adjuncts as before and the viniyoga for the control over enemies. 104. Two-armed, golden-bright, devoted to the service of Rama, slayer of Lavanasura, I worship the son of Sumitra. 105. The mantra of Hanuman, “hrum hanumate” is the king of mantra-s, of which Ramachandra is the Rishi, and the other rituals to be done as previously. 106. One should meditate on the two-armed one who is shining like gold, who is devoted to Rama’s service, wearing the girdle of munja-grass and is the servant of Rama. Thus ends Second Chapter of Rama-rahasya Upanishad. “To begin with, the altar is six-sided (hexagonal) and in the center is written the seed-letter (bijakshara) of Rama (Ram), with shrim. Below that in the second corner is the Sadhya (food offering). Above it on the sixth corner is the Sadhakam (Constant devotion). On the surrounding sides are the seed letters of Jiva-Prana-Shakti. Encircling all these is OM. In the South-East, North-East, North-West, & South-West, on the front corners, are kept the cooked rice. Then sequentially the Heart mantra-s viz Ram, rim, rum, raim, raum, rah bija-akshara-,s the heart ‘astra mantras’ are to be recited. Behind the corners are the bija-akshara of Rama and Maya, on the corners varaham hum; over this is the Kama-bija (Ram) and surrounding it, is the Vac (kiim). Thereafter are three circles of eight leaves. On the leaves, garlands of syllables in eight groups of six-lettered mantras are inscribed. On the face of each leaf the eight-lettered (mantras). On the face of each petal shri bija. As well as on their fronts, in all directions. In a circular manner. On the front of the petal, Maya bija (kiiM). On the front of each in two circles – hram, sram, bhram, bram, bhramam, shrum, jram. Then in a circle. On them, the king of mantra-s – Nrisimha anushtubh. On front of these, the 8 vasu-s, 11 rudra-s, 12 aditya mantra-s, along with OM and namo, in sequence, in dative case. Outside and surrounding is vashat. Then the Bhupura of three lines. In 12 directions, adorned with the rashi-s (Zodiac signs). Abiding there the 8 naga-s (serpents). In the 4 directions, the Narasimha bija. In the intermediate directions, the Varaha bija. This all-encompassing yantra fulfills all wishes and grants liberation. Beginning with the 1–lettered and ending with the 9-lettered (mantra-s), this is the yantra and the tenth becomes the avarana (covering for it). One should worship Raghava, with ‘anga-nyasa’, in the center of the hexagon. In the first round, the anga-nyasa is done at all the corners. At the root of the 8 petals, the initial cover of oneself. Then the covering by Vasudeva and others. At the base of the second 8-petals, the ‘cow covering’. Then covers of Hanuman and other. For the 12-petalled, Vasishtha covering. For the 16-petalled, the blue lotus covering. For the 32-petalled, Dhruva covering. In the Bhupura, Indra covering. Outside this is the vajra covering. Offering thus, one should silently chant. Now, the altar is described for the mantras starting with 10 syllables and ending with 32 syllables. In its center the name of the ‘ishta’. Thus surrounded by Kama bija. The remaining nine surround this. At the six corners, the 6-fold anga-nyasa, in the front and back of the intermediate directions (S-E, N-E, N-W, S-W). Then the 8-petals; on the petals, garlands of syllables, in multiples of 6. In a circular manner. Surrounding this, in all directions. Outside this the Bhupura, with 8 spear-points. In all directions, Narasimha and Varaha. This is the Great Yantra. Adhara-shakti (basic power) is the seat of Vishnu’s worship. The first round is of anga-nyasa. In their front, the bow and the arrow. At the base of the 8 petals, two avarana-s of Hanuman. The third avarana of cow. Thus worshipping the yantra with devotion, one should recite the 10-lettered and other mantra-s. Thus ends the Third Chapter of Rama-Rahasya Upanishad. 1. He should bathe thrice a day. 4. He should give up the six negative emotions like anger, jealousy etc. 5. He should observe purity and practice dispassionate speech. 6. He should also observe dispassionate action and show respect to all women. 7. He should observe celibacy and sleep on the bare ground. 8. He should not have any desires. 9. He should be devoted to his teacher. 10. He should scrupulously observe bath, worship, recitation, meditation and oblation to the fire. 11. He should meditate with utmost concentration on Rama as instructed by his teacher. 12. He should invoke the sun, moon, Teacher, lamp, cow, Brahmin, etc. 13. The ascetic doing this japa should sit on a tiger skin and adopt postures prescribed like the Swasthikasana in rotating sequence. 14. He should seat himself below plants like Thulasi or trees like Parijata, Bilwa etc. 15. He should count using a rosary whose beads are either made of thulasi plant or use rudraksha. 16. The counting should be done mentally using the beads and should be one hundred thousand times at the altar of Maha Vishnu. 17. Tharpana should be offered after every ten total count. After ten counts offer rice pudding, pour over it clarified butter made from cow’s milk and eat what remains after the next tenth portion. 18. After this along with chanting flowers have to be offered along with the chanting of moola mantra,. The ascetic who does this japa becomes liberated in life and the supernatural powers follow him like a bride follows her groom. This Rama-mantra is not only a means to liberation, but if you remember me who am Rama’s servant, it will ensure success in these worldly affairs too. To the one who for ever remembers Rama with total devotion as the final refuge of the mind, I am empowered to fulfill all their chosen wishes. Towards the task of fulfillment of the wishes of the devotees of Rama, I – as an expert in carrying out Rama’s commands - am always wholly alert. Thus ends the Fourth Chapter of Rama-rahasya Upanishad. Sanaka and other ascetics asked Hanuman: “ Tell us the meaning of Sri Rama mantra”. [ shri Ramah sharanam mama! ]. Where yogi-s revel in the 2 syllable mantra viz. ‘Ra ma’ where the ra syllable denotes fire wherein abides illumination. Its nature as Existence-Consciousness-Bliss is regarded as the supreme meaning, the consonant denoting the unchanging Brahman, and the syllable the energy of manifestation. Know that Consonants joined to Syllables are used in breathing; the sound ‘r’, of the nature of light, is therefore used in action. The sound ‘ma’, is known as ‘maya’ indicating prosperity; being itself the seed-letter (bijakshara) is also equal to Brahman itself. With the ‘bindu’ (anusvara), the Purusha takes on the form of Shiva-Sun-Moon, the flame as the crest, and the sound as the Prakriti. Both Purusha and Prakriti jointly are considered as Brahman; the bindu, sound and the indwelling seed-letter as Fire and digits of the Moon. Fire and OM by their very nature abide in the seed-syllables of Rama, just as the great tree in the mundane life is contained in its seed. Similarly, in the seed-syllables Rama, is contained this whole moving and unmoving world. The name Rama is thus regarded as the seed with both these meanings. When freed of the Maya-seed (kiim), the Supreme Spirit is said to exist (alone). This grants liberation to aspirants, and the ‘ma’ sound is regarded as the liberator. Formless ‘ma’ in Rama is the grantor of enjoyment and liberation.The first letter ‘ra’ stands for the term ‘tat’ (That), and ‘ma’ stands for the term ‘tvam’ (You). The wise knower of Truth declare that the confluence of the above two terms end in the meaning ‘asi’ (Are). The word ‘namah’ has the meaning of tvam (you) and tat is denoted by the word Rama. When used in the dative case (Ramaya), the meaning asi (are) is indicated in the mantra. Wherefore, the sentence ‘tattvamasi’ grants the unitive salvation. Therefore, this (mantra) giver of enjoyment and liberation surpasses the afore-said sentence (tattvamasi). All embodied human beings are qualified for this mantra. For those desiring liberation, the dispassionate ones, as well as house-holders and in all stages of life, constant meditation of OM, and especially for ascetics, is enjoined; for the knower of the meaning of Rama-mantra doubtless become liberated while alive. One who studies this Upanishad becomes sanctified by fire, purified by air, is freed from the sin of consuming intoxicants or of theft of gold or of the slaying of a Brahmin. One who recites the Rama-mantra repeatedly merges in Ramachandra himself. Therefore, this sacred hymn: Those whoever say “I am Rama in essence”, will not feel any want in this life, and without a doubt is Rama Himself”. This is the Truth. This is the Upanishad. Here ends the Rama-Rahasyopanishad, as contained in the Atharva-Veda.